This project, with strong support of all main stakeholders in history education in Turkey, including teachers, researchers, curriculum developers, textbook authors and assessment policy makers, shifted the national attitude of history educators and their students by assisting the new generation of the Turkish history educators and educational decision makers, often educated abroad, with the implementation of the requirements for the new social studies and history curricula among the professional history educators. What followed was a very systematic and wide-scale implementation an innovative methodology and wider European perspective within Turkish history education. The project supported the development of history and citizenship education in Turkey through promoting collaborative European values such as critical awareness, mutual respect, peace, stability, and democracy. Intercultural dialogue through enhancing professional co-operation, communication, and networking within Turkey and beyond in order to support the increasing connectedness of the professional group with each other and with their counterparts in Europe. Contribute to participatory governance, supporting the newly developing history educators network and developing independent and self-sustaining professional organisations. The initial plan was to involve a selected network of 9 educational establishments (Schools, Teacher Training Colleges, Universities, Board of Education) from 8 cities in Anatolia and Black Sea Region. During the project this group widened towards 106 institutions representing 218 professionals from 58 cities: Adana, Adıyaman, Agri, Aksaray, Amasya, Ankara, Antalya, Baku, Balıkesir, Batman, Bingol, Bitlis, Bolu, Burdur, Bursa, Çankırı, Corum, Denizli, Diyarbakır, Edirne, Edremit, Ereğli, Erzincan, Erzurum, Eskişehir, Gaziantep, Hatay, Hendek, İstanbul, İzmir, Kahramanmaras, Karabük, Kastamonu, Kayseri, Kırıkkale, Kırklareli, Kirsehir, , Kocaeli, Konya, Korydallos, Malatya, Manisa, Mersin, Mugla, Mus, Nevşehir, Niğde, Ordu, Rize, Sakarya, Samsun, Sivas, Tekirdag, Tokat, Trabzon, Uşak, Yozgat , Zonguldak. The History Educators’ Association of Turkey was created and legally-approved in 2009, and held its first General Assembly in January 2010 in Kizilcahaman. The Association became EUROCLIO Member in 2010. The project also inspired the Association of Social Studies also to apply for EUROCLIO membership. This Association obtained EUROCLIO membership in 2011. However Turkish bureaucratic procedures and complex political circumstances lack still to create an independent civil society friendly environment. New tools from social networks however allow professionals to operate outside the fixed parameters. Therefore, an active Facebook groupTarih Egtimice has been created in January 2012. On 30 April 2012, by the end of the project,this fast growing network had 1275 members. The project increased the Regional and International outreach of Turkish expertise on innovative history and social studies education. During the full project, history educators from Azerbaijan and Georgia participated as observers in all capacity building events. This inspired the colleagues from Azerbaijan to set up their own Association and to join a EUROCLIO Project Application for the EU Eastern Partnership, which was granted in the end of 2011. 145 international delegates, representing 45 countries including Armenia, Israel, India, USA, Russia and Iceland, participating in the 19th EUROCLIO International Training Conference in Looking at the History through a Variety of Lenses, held in Antalya, Turkey, from 1-8 April, where the materials were launched and disseminates widely. Project coordinator Dr Semih Aktekin is in 2011 elected as EUROCLIO Board Member. Project coordinator Dr Mustafa Ozturk is in 2011 asked to become member of the Editing Board of the EUROCLIO Bulletin, the on-line Magazine on History, Heritage and Citizenship Education. He was in 2012 invited to become EUROCLIO Ambassador, as acknowledgement for his contributions to implement responsible and innovative history. Project participants and other EUROCLIO members became involved in Comenius school exchanges and other partnerships for example between Latvia and Turkey or Turkey- Kosovo. 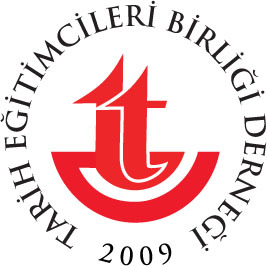 The authoring, peer-review as well as editing process has heavily supported the changing of Turkish traditional hierarchic approaches, by encouraging more open attitudes and equality in dialogue between academics and teachers, giving space to reflection and creating awareness of gender and diversity issues. The configuration of the editing group gives evidence of this new awareness by selection criteria as quality as well as gender, age, geography and institutional affiliation. Chief Editor Dr Huseyin Koksal and Academic Project Advisor Dr Bahri Ata were invited to participate in the revision process of the history curriculum for the facultative history classes for grade 9-12, which was finalised in 2012. The teaching tool is submitted for assessment by experts of EGITEK (Education Technology Department) to be accepted within the new e-book learning system of the Turkish Ministry of Education. One of the five editors of the publication, Celal Genc, was invited into the author’s group from the region of Samsun that in 2011 drafted history textbooks for grade 9-12 on request by the Turkish Ministry of National Education. In 2010 the project also inspired Academics and Teachers Trainers to organise the First International Conference on History Education in Erzurum 2010. Many of the project participants were among the event organisers and the lecturers and workshop moderators. In 2012 the second International Conference will be held in Trabzon, with again intense participation of the project participants. Professor Dr Mustafa Safran, Academic Advisor of the project, and involved in all project activities, is in 2012 appointed as the chief-academic advisor to the Turkish Ministry of National Education in the process of restructuring the teacher training for all subjects and levels. The publication is used as basis for pre-service and initial-service training in most of the universities that have participated in the authoring of the material. The Chief-Editor of the publication Dr Huseyin Koksal and Academic Project Advisor Dr Bahri Ata, and also some of the authors of the initial teaching materials, Yasin Dogan, Hasan Isik, Aysten Kiris, Ahmet Tokdemir, Ahmet Dogonay and Selahattin Kaymakci were in 2010 appointed as in-service providers by the Turkish Ministry of National Education. They were made responsible to train the newly established formator teachers using the project teaching materials. The project also is impacting the national history examinations for primary and secondary level. The Chief-Editor Dr Huseyin Koksal and Academic Project Advisor Dr Bahri Ata Huseyin and Bahri work since 2012 for EGITEK, drafting the questions for exams for history for primary and secondary level (phase 1). 7 National capacity building seminars were organised in Ankara, Antalya, Bolu, Istanbul, Kastarmanu, and Kizilcahaman on topics such as from theory to practice; possibilities of ICT for innovative History Education and working with a diversity of sources. The audience was trained by many national and 15 international (peer specialists from 6 countries: Denmark, Malta, The Netherlands, Republic of Macedonia, Russia and United Kingdom. Many participants stated in the end of the project that the training had provided them with an in-depth extra degree in the learning and teaching of history and social studies. Sharing, discussing of experiences of using innovative approaches in history and social studies approaches is continued on a fast growing face book group Tarih Egtimice, pushing for a wider usage of innovative methodology. 42 Turkish history and social studies educators were able to participate in international capacity building events in 20 countries: Azerbaijan, Bosnia-Herzegovina, Bulgaria, Croatia, Cyprus, England, Georgia, Germany, Greece, Hungary, Israel, Latvia, Macedonia, Montenegro, The Netherlands, Norway, Poland, Russia, Scotland and Switzerland. The trainings focused on a variety of issues such as development of on-line teaching materials, active learning, emotive history, teaching diversity, and holocaust education. Piloting in classroom settings took place among 4900 students from approximately 32 cities across Turkey, carried out by the Editors of the teaching tool and the newly appointed group of Formator (in-service training) teachers. Each of them tested one or two modules in several classes. The book was disseminated to all Education Faculties, Public Libraries and Regional Education Authorities as well as all members of the Association. By the end of the project on 30 April 2012, the Turkish version of the tool was downloaded 6285 times (from e-tarih (3102) and from the site of the Turkish History educators Association (3183) The audience is a wide variety of ‘users’ such as teacher, trainers and students. The English version has been on 30 April 2012 downloaded from all sites 150 times. The downloading was still continuing at that moment. The English language resource book was disseminated as training material among all international participants of the 19th EUROCLIO International Training Conference in Looking at the History through a Variety of Lenses from 1-8 April in Antalya, Turkey. During Conference the participants visited 9 schools (3 primary, 6 secondary) and 2 University Departments (Education and History) of the Antalya region. This opportunity was used to propagate the Turkish language publication. The English language publication was disseminated among the colleagues from the seven countries of Former Yugoslavia, which work together in the project History that Connects. How to teach sensitive and controversial issues in the countries of former Yugoslavia, developing inclusive and multi-perspective (on-line) teaching tools on the emotive history of the region from the period between 1900-1945. Internal peer-review assessments of the teaching tool has been carried out during a wide variety of activities. The project made use of a mixture of seminar and workshop approaches with focus on capacity building as well as on develop teaching resources. All involved played a vital role in peer assessing the materials and giving feed forward. Improved modules were again presented and reviewed in the a later workshop. Peer reviewing took place with the group of Formator Teachers was done in partnership with Ministry of Education in Erzurum, Yalova, Antalya and with the group of Formator teachers (those that are responsible for ins-service trainer in their provinces and regional in order to cover all of Turkey). Peer reviewing was also done during the 19th EUROCLIO International Training Conference in Looking at the History through a Variety of Lenses from 1-8 April in Antalya, Turkey. The workshops scored on average as high as the international workshops. 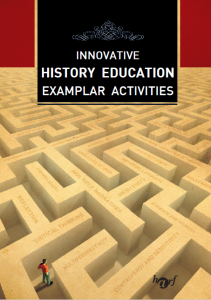 Hard-copy publication Innovative History Education, Examplar Activities including 8 modules (96p). (2012) Printed in 500 copies. The External Conference Review can be found here as a PDF file. 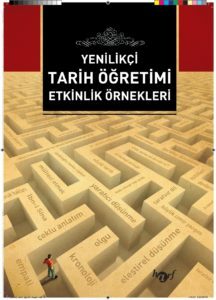 Hard-copy publication Tarih Nasıl Öğretilir ? Tarih Öğretmenleri İçin özel Öğretim Yöntemleri, (How is history taught? Special Teaching Methods for History Teachers) Edited by Prof Dr. Mustafa Safran (384 p) (2010) Printed in 1000 copies. The book contains 39 chapters by different authors with titles such as Multi-perspectivity in History Education; History textbooks in Contemporary Countries: An International Perspective; Values in History Education and Evidence in History Education. More information on this publication can be found on here.